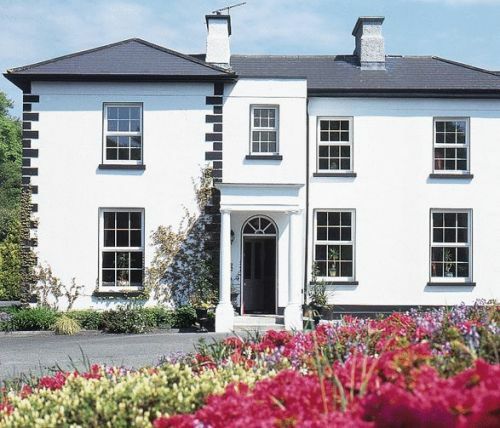 Ross Lake House Hotel is tucked away off the N59, the Galway to Clifden road. Approximately halfway between Oughterard and Moycullen there are signs for the house. A fairly narrow winding road leads into the hillside and even when you come to the entrance, there is still a fair drive up to the house. This drive is under beautiful trees with a tumbling river alongside. The house is described as a “detached asymmetrical 3 bay 2 storey house with projecting bay and service yard attached, c1860. The building is rendered and has a hipped roof. Windows refitted, portico added, c1990. The interior retains some original features including joinery and chimney pieces. Set in landscaped grounds”. James E. Jackson (1824-1907) owned the town land of Killaguile, which is situated in the parish of Killannnin and the barony of Moycullen. That town land takes its name from Cill an Ghaill, possibly meaning ‘the church of the foreigner’. James bought the property in August 1853 from Robert Martin of nearby Ross House. A family connection arose, possibly from that deal, or because of them being neighbours. James married Madeline Bushe of Dublin in 1863, daughter of Judge Arthur Bushe. Robert’s sister Marian was the second wife of the Judge. 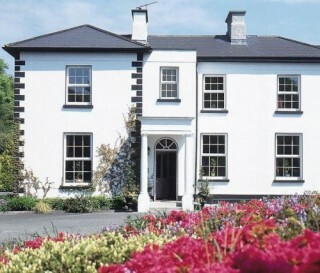 Around the time of his marriage, he built the house at Killaguile which is now known as the Ross Lake House Hotel. James Edward was the second son of the Reverend James E. Jackson, rector of Ardee, CountyLouth and later Dean of Armagh. This gentleman had moved to Ireland and lived with his cousin in the North. He married his cousin Lydia and they had a couple of children. Shortly after the birth of their second child, Lydia died. A number of years later he married for the second time. His new wife again was again Lydia, and James E. who was born in countyLouth was of that family. James Edward Jackson went on to be a land-agent for Lord Iveagh at Ashford castle. He was also a farmer and one of the county magistrates. He is remembered as being a good landlord and one who helped his tenants in time of need. Killaguile House and its estate comprised of 1200 acres of good quality limestone land, and Jackson, in line with the practice of some of the many landlords of that time began improving his holding. Land was cleared and crops were set. Ornamental trees were planted around the estate and walls were built which divided the farm into various parts. The surrounding woods would have had paths cleared through them, allowing easy access to the shooting which was available in the cover. The local lakes would have had small piers or landing places built to facilitate fishing. A report from the 20th century names Killaguile as being one of “the well wooded demesnes in this part of Galway”. James E and Madeline went on to have ten children, seven of whom survived. Their eldest son, named after his father and grandfather was born around 1867. He went on to become a civil engineer and worked for some time with the construction of the Galway to Clifden railway line. In fact, the railway track was passed through the estate and fairly close to Ross House. The plans for constructing a railway line through Connemara were numerous and the ideas and plans had been bandied about since the late 1860’s or early 70’s. There were many proposal’s, with some people favouring the more populated coastal route, but whatever reason the less populated mid section of Connemara was chosen. As well as the many plans and discussions, there were many false starts. In 1890 some work had begun and hopes were high for employment and opening up development potential, but within the year these works were closed. The line finally opened on January 1st, 1895 but even then it went only part of the way, terminating at Oughterard. It took until July of that year for it to reach Clifden. There must have been great rejoicing along the way, especially in the various estates such as the Jackson house, knowing that their produce would find a larger market and reach those marketed in even shorter time than in the past. For the engineers like James this first section between Oughterard and Galway or even Maam Cross was fairly easy. Digging in this part was through bog or sandy soil, especially around Killaguile. It was not very good practice for the solid rock they were going to have to work their way through as the line made its way closer to Clifden. James Edward died and the estate was passed to his second son Alfred. He later left Connemara and immigrated to India, where he spent the rest of his life. Subsequently the land was divided by the Land Commission and the house and the reduced estate was sold. Between the 1920’s and the 1960’s the house had a number of different owners, eventually being bought by a German couple who converted it into a hotel in 1969 and renamed it Ross Lake House. In the 1980’s the house was bought by Henry and Elaine Reid who spent the next few years restoring it and the house is still run by the Reids as a hotel and restaurant. Regarding Killaguile House and lands. This property was gifted by William Martin of “Killigaile” on the 11th of December 1841 to Robert Martin of Ross House. The witnesses to the deed were: Mark Thomas of Drimneen and Thomas Cottingham of Sallyhill (Ardnasellagh). The area which included Knocknalee hill comprised 1,062 acres. In August, 1853 it was sold by Robert Martin of Ross and his wife Mary Anne Martin, otherwise Blackley to James Edward Jackson of Dublin, but now of Killagaile, Barrister at Law for the sum of £2,000.00 to be paid or secured. It would appear that James Edward Jackson met the Martin family through the law library. As regards the original name of “Killaguile”, I would be inclined to favour “Cill an gCoill” or Wood Church. The nearby larger lake is known as “Lough Aifreann”. As regards James Edward Jackson he was for a number of years chairman of the Oughterard Board of Guardians. Local history states that he at one time intended to evict the families in Gortacarnaun in order to create an avenue from the N59 at Doon to his home. The families complained to Father Patrick Coyne who was the Priest in Charge of Killanin at the time. He interceded with the landlord, Richard Martin and the matter did not go any further. Following Father Coyne’s dispute with Archbishop McEvilly of Tuam in relation to the transfer of the Roman Catholic parish of Killanin to Galway Diocese he went to Rome in Jamuary, 1891 to argue against. On his return in June, 1894 he found that most of the parishioners were supporting Father Mark Conroy who had been appointed in his absence. He was angry that the people of Gortacarnaun were no longer supporting him and is reputed to have cursed them, having earlier interceeded on their behalf. In times of illness and death this had a profound effect on some families.